when using a high pressure washer on persistent marks, do not keep the lance directed towards the lamps or their edges for too long, so as not to damage their protective coating and seals, do not touch the bulb directly with your fingers, use lint-free cloths. 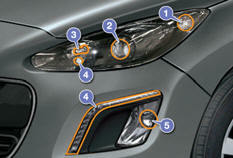 It is imperative to use only anti-ultraviolet (UV) type bulbs in order not to damage the headlamp. 2. Dipped beam headlamps (H7 - 55W). 3. Main beam headlamps (H1 - 55W). 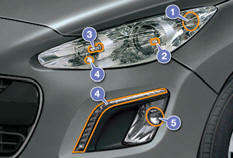 Daytime running lamps / sidelamps (LEDs). 5. Foglamps (H8 - 35W). 1. Direction indicators (PY21W SV silver). 2. 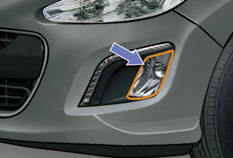 Directional dipped / main beam headlamps (D1S-35W). 3. Additional main beam headlamps (H1-55W). 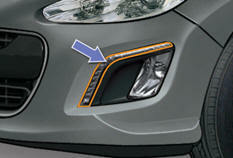 Xenon bulbs (D1S-35W) must be replaced by a PEUGEOT dealer or a qualified workshop. Amber or silver coloured bulbs, such as the direction indicators, must be replaced with bulbs of identical specifications and colour. 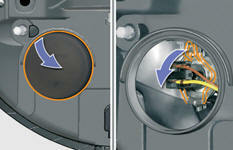 When refitting, close the protective cover carefully to assure the sealing of the headlamp. 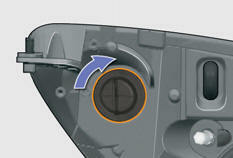 Remove the protective cover by pulling the tab. 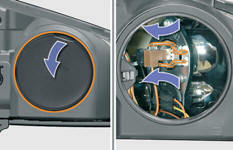 Extract the bulb and change it To refit, carry out these operations in reverse order. 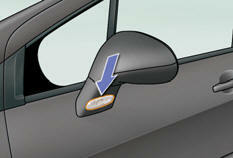 Insert a screwdriver at the middle of the repeater between the repeater and the base of the mirror. 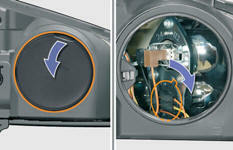 Contact a PEUGEOT dealer or a qualified workshop to obtain replacement repeaters. To replace these bulbs contact a PEUGEOT dealer or a qualified workshop.